Never miss another deadline!A proven method that defeats procrastination forever by conquering emotions, not time managementProcrastination is a serious and costly problem. And time management isn't the solution. Author William Knaus exposes the deep-rooted emotional and cognitive reasons we procrastinate and provides solutions to overcome it. Where other books offer time-management techniques and organizational tips as superficial fixes that don't work in the long run, End Procrastination Now! goes deeper and shows you a three-pronged approach to get off and to stay off the procrastination treadmill. 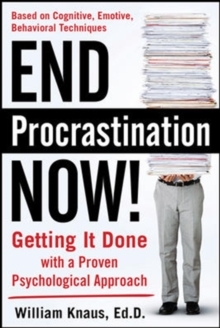 End Procrastination Now! provides you with expert advice on how to stay on track, stay focused, and meet deadlines. Psychologist William Knaus outlines a step-by- step plan to get over procrastination by recognizing its causes, building positive feelings towards what needs to get done, and implementing effective solutions that help you cut bad habits to successfully get more done in less time. You'll learnThe natural "causes" for procrastination and how to track and then stop procrastination. New techniques that cut through procrastination barriers that affect work and productivity. To reduce stress caused by procrastination through the unique cognitive, emotional, and behavioral approach.